Conrad L. Osborne is one of the most highly respected writers about opera living today. The object of a devoted following among serious devotées of the genre, he started writing for Opera News as a young man and quickly demonstrated the extraordinary combination of technical knowledge and deep insight for which he has become known, expanding his palette over the years to High Fidelity, Financial Times, Opus, New York Times, Metropolitan Opera Guides to Opera on Records and Video, and Musical America. Today his musings and analysis can be found on his entertaining and highly informative blog, Osborne on Opera: A Critical Blog. As explained on Mr. Osborne’s website conradlosborne.com, his childhood love and fascination with opera led eventually to vocal studies, training in acting technique and years of professional performance as singer and actor - experience that has been crucial in forming Mr. Osborne’s knowledge and awareness of the many-faceted discipline of the performer’s art. He also worked in opera development and administration, serving on the staffs, boards, and as consultant to several important organizations in that field.This foundation proved essential to the depth of knowledge he brought to his life’s work - writing, teaching and criticism. Over the last 50 years an ever greater proportion of his time has been taken up with teaching voice, which he greatly enjoys and which offers him the opportunity to make an impact on the field in a very different way than criticism. 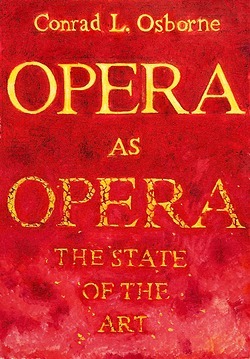 After decades of devotion to the art form, as Mr. Osborne puts it in Chapter II, “...it was Robert Wilson’s production of Richard Wagner’s Lohengrin for the Metropolitan Opera (March, 1998, and retained in subsequent revivals) that proved the last-straw impetus for the writing of this book.” Eighteen years in the making, Opera as Opera: The State of the Art is a triumph of insightful scholarship, illuminating what is probably the most complex art form, from the inside out.